Every since I was knee-high to a grass hopper one of my favorite things to eat was buttered toast. I would have it for breakfast, sometimes as an after school snack while I watched School House Rock & Scooby Doo … And if I really wanted to jazz it up I would add some good ole’ government cheese on top … Man, Those where the times (LOL) … Now-a-days my diet has changed and I tend to be more watchful of what I eat. But then there are those times when I just crave something that is just plain wrong and all the way fattening … Besides, who said you can’t indulge every now and then? 2. Mix butter, cheeses, green onions, garlic and mayonnaise in a small bowl and set aside. 3. Cut the loaf of bread in half. 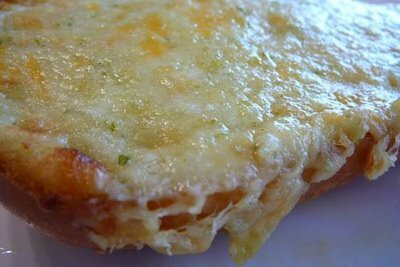 Spread the prepared cheese mixture on each half of bread, and bake at 350 degrees for 8-10 minutes, or until cheese is bubbly and brown. 4. Cut into slices & serve. Posted on August 8, 2012, in Lady Fab Cooks and tagged asiago cheese, dinner, food, French bread, garlic, green onion, Italian bread, monterrey jack cheese, parmesan cheese, recipe, the porter house grille, vegetarian. Bookmark the permalink. Leave a comment.